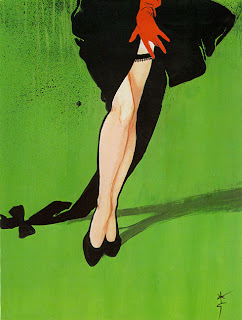 Famous French fashion illustrator René Gruau was born in Rimini, Italy, in 1910 as Renato Conte de Savagli-Ricardelli. His French mother separated from his father when he was two or three years old, often moved and traveled, and he accompanied her. 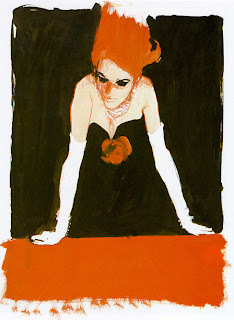 In the late 1920s, they moved to Paris, France, and he started his career as an illustrator for fashion magazines. 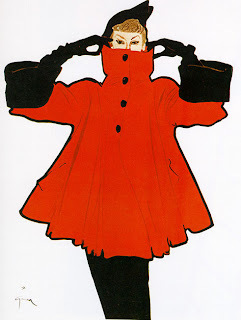 From 1955 onwards, photography took over illustrations and fashion drawings in several newspapers and fashion magazines. From this time on, most of Gruau's work concerned fashion advertising (fashion accessories, gloves, perfume, cosmetics, lingerie,fabrics etc.) In 1989, a René Gruau Exhibition was held at the Musée du Costume at the Palais Galliera in Paris. To this day, he continues to work for advertising, and has started drawing for fashion magazines again: Elle, Madame Figaro, Vogue, L'Officiel de la Couture.